We are writing to you on behalf of an alliance of European businesses, associations, investor groups, trade unions, local and regional authorities, and civil society organisations. 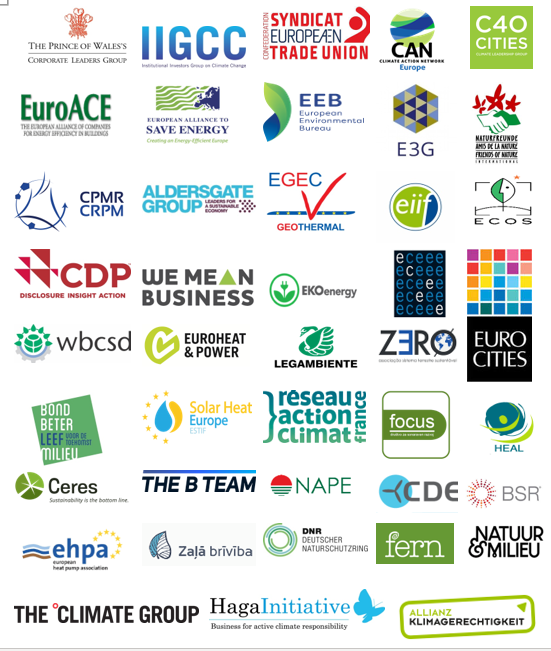 Unprecedented citizen mobilisations are taking place across EU member states calling for increased action against climate change, showing that climate action is an integral element of the future of Europe and that increasing the EU’s commitments under the Paris Agreement is an urgent necessity. At the upcoming European Council on 21 March you have been invited to discuss these commitments, in particular the Commission’s vision for a climate neutral economy. We welcome the Commission’s proposal to reach climate neutrality by 2050 at the latest. As indicated by the Commission’s analysis, based on existing technologies and solutions, the just transition towards a net-zero emissions economy is feasible and provides numerous economic, environmental and social co-benefits. These include health for citizens, additional jobs, increased competitiveness and energy security, and more sustainable economic development. Representing stakeholders from across sectors and across Europe, we believe it is high time for European leaders to rise up to the challenge of climate action. We need Europe to transition to a sustainable society and economy as soon as possible. Member states can count that our organisations, businesses, cities, regions, and trade unions will continue leading the transition to a zero-carbon Europe. We count on your leadership and determination to ensure a safer future for European citizens. Endorse the objective of net-zero greenhouse gas emissions by 2050 at the latest, as part of the future of Europe vision, at the special EU Summit in Sibiu in May 2019. Acknowledge that reaching net zero greenhouse gas emissions in 2050 in the most cost-effective manner requires raising and aligning the 2030 ambition level at the latest during the UN Climate Summit in New York in September 2019. Send a clear message that the EU stands ready to review its 2030 contribution to the Paris Agreement. 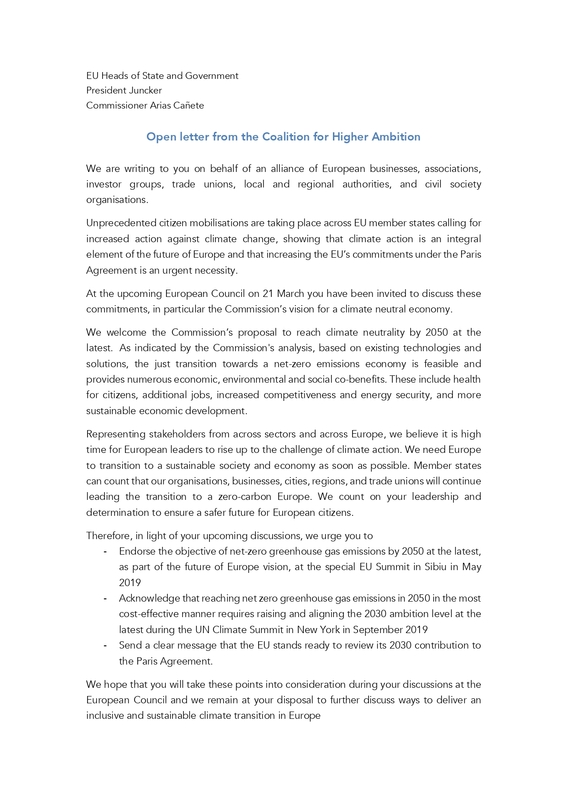 We hope that you will take these points into consideration during your discussions at the European Council and we remain at your disposal to further discuss ways to deliver an inclusive and sustainable climate transition in Europe.